At Better Built Barns, we know that the holiday season is more about giving than receiving, but it’s still nice to get those gifts that you’ve been thinking about all year. You may be someone who tends to put more practical gift ideas on your list, such as a new ladder or a new lawn mower. The only drawback to getting these gifts is that once you have them, you need somewhere to store them! With our custom shed options in Oregon, you can have the perfect storage solution right in your backyard. If you’re someone who receives a lot of outdoor gifts each year, your first instinct may be to keep everything in the garage. It may be your only option, but that doesn’t mean you’re not worried about cramming too many things into the space. You might have the perfect spot for that new extension ladder, but that doesn’t mean that it won’t accidentally fall off the wall and scratch your car. If you get a new lawn mower, you’ll need somewhere to store it, as well as the fuel, oil, and other items you need for it to run smoothly. If space is limited in your garage, or you’d rather keep those items in another location, a small shed could be the best option. Perhaps you love to garden and your holiday wish list is filled with gardening supplies. Even though you’ll have to wait until spring to begin tilling and sowing, you’ll be excited to get new rakes, planters, and everything else you need to grow beautiful flowers and delicious produce. If you’ve been thinking about how great it would be to have a garden shed for all of your tools and supplies, then we’re here to help you find the best option for your property. Instead of storing everything in the garage or on the back porch, you can put your garden supplies into your new shed, where they’ll be well-protected and ready to go once spring arrives. If you didn’t put garden tools or lawn equipment on your list, but you opted for outdoor toys such as a new scooter, motorcycle, or bicycle, a custom shed could be the best place to store it. You can create a safe place for your new equipment, and you’ll also have a space where you can work on your new toys. If you love building and racing RC cars, a new shed could be the perfect workshop for your hobby. Instead of taking up room in the basement or the spare bedroom, you can keep everything in your new backyard building! The holiday season is a great time of year, and at Better Built Barns, we hope that you get everything you’ve asked for (and that you find those perfect gifts for those on your list). 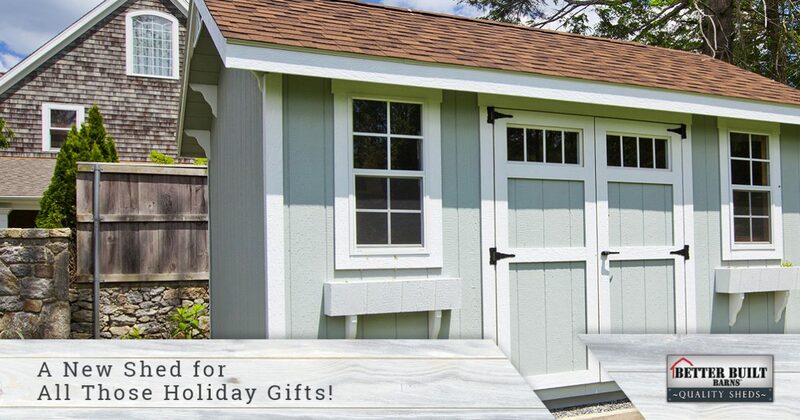 If you’re thinking about where you’re going to store those new outdoor tools or toys, take a look at our custom shed options today.